Follow the daily news about Woolsack on Facebook, on Twitter, on Ravelry and the Woolsack Blog. Most daily information is listed on the above sources - if you don't follow twitter then you can see the Woolsack twitter feed on the right hand side of this page and on the Woolsack home page. Significant news about the website will also be posted on this page. The new Single Farm Yarns page has proved very popular and I've now added a page for Regional Yarns and Wool Products. In early July there was some serious misrepresentation about British wool & sheep made as part of a fundraising effort on Kickstarter, and in associated social media. In response to this a new page has been started listing flocks of sheep in the UK that are Wool-Only flocks and people who wish to purchase wool products from such flocks are already finding it helpful to have easily available links to them all. Also, since this isn't the first time that outrageous and wholly incorrect claims have been made about the welfare of British sheep and shearing practices, I've taken experienced advice to help me put together a page giving a summary of the true facts about British sheep welfare, with links to official regulations and guidance. This can all be found on the Welfare of Sheep & Shearing in UK page. Please do let me know about Single Farm or Regional Yarns that aren't already listed, and any more Wool-Only Flocks that I've not yet found. I'd just like to remind all the stockists and businesses listed on Woolsack that there are no commercial links at all. The Woolsack website remains a free service that is run and funded by Jane (who is passionate about British wool) with help from some lovely volunteers. So if you are contacted by anyone suggesting or giving the impression that they have some special link or validation from Woolsack, then this just isn't the case. Anyone could go through the website to get contact details for all the British wool related businesses and contact them. Please treat any commercial contacts from anyone suggesting they are linked to the Woolsack website with due caution and apply normal checks before entering any agreement or handing over any money. The Woolsack twitter feed can now be viewed on the website Home Page and News Page. New website page, Sheep Sponsoring/Adoption, to see if there is sufficient demand from spinners/knitters/crafters who would like a more personal relationship with a sheep or flock and to be able to end up with fleece, fibre or yarn from 'their' sheep or share of a flock. List of Hand Knitters and Hand Spinners who offer a professional spinning to order or knitting to order service. This list is the result of numerous requests for such services through the contact page and realising it would be helpful for people to have a list of some of those offering these services. This has links to information about how to choose a good fleece for handspinning and advice and information for farmers to help them produce the best quality fleeces for sale to handspinners. For the whole of November the amazing, informative, totally distracting WOVEMBER website is full of posts, news and images of WOOL. 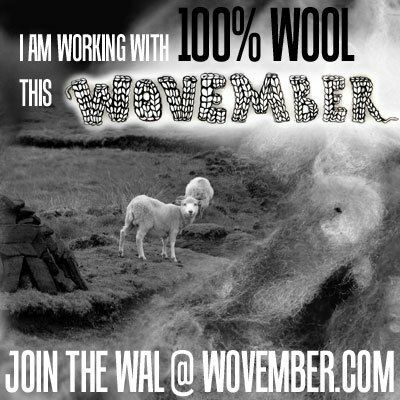 It's all about wearing wool this November and celebrating that real wool comes from real sheep. Every day new posts are added to the website and this year the theme is around “closing the gap” between producers and consumers of yarn. Whether you grow wool, process it, craft with it, or turn it into amazing woolly garments & items there will be something to interest and delight you in WOVEMBER! We're in the middle of British Wool Week now and what a week it's turning out to be! This is the general events page for Campaign for Wool, but much more detailed information can be found in the Love Wool UK section. Also taking place during UK Wool Week are Yorkshire Wool Week, Strathearn Wool Week and Wool School & Clickety Click on the Clickety Clack - see Campaign for Wool events for more details. There will be a page on the website listing books of interest to British sheep and wool enthusiasts, but in the meantime, if you don't already have a copy of The Fleece & Fiber Sourcebook you may want to check it out.